Corpus Christi Hooks: The Hooks were previously the Round Rock Express, which is now a Triple-A team in the Pacific Coast League. This was possible when the ownership group that owns the Hooks bought a Triple-A team from Alberta (the Edmonton Trappers) and moved them to Round Rock, allowing the then-Round Rock Express to make the move to Corpus Christi. The Hooks' primary logo features a "Hooks" wordmark in which the o's are the eyes of fishing hooks. The fishing hooks loop down below the underscore to reinforce the theme of submerging into water to catch fish. The city name appears inside a Texas flag-inspired banner above the "Hooks" wordmark. The team's mascot, a hook wearing a hat and holding a bat, is stitched onto the home caps, while the away caps are emblazoned with a CC logo (for Corpus Christi) made from two fish hooks. The jerseys are vests with placket piping. While the home jersey uses a modified Hooks wordmark with non-fish hook o's, the road jersey uses the CC logo as a crest, placed on the left chest. Northwest Arkansas Naturals: The Naturals are a new team, having only been the Naturals since they moved from Wichita following the 2007 season. The name "Naturals" is a reference to Arkansas's nickname, "The Natural State". The primary logo consists of a mountain, a waterfall, and a baseball streaking to the left, in addition to a "Naturals" wordmark. Speaking of the wordmark, it uses an italicized and arched sans serif with a bevel. In addition, the N at the beginning of the wordmark features a lightning bolt, which is possibly a reference to Roy Hobbs from "The Natural". (Roy Hobbs carved his bat, "Wonderbat", from a tree limb that was struck by lightning.) The caps use the N monogram for home, away, and alternate. The home jersey and alternate jersey display the "Naturals" wordmark from the logo, while the away tops opt for "Northwest Arkansas" across the chest. Overall, the identity is pretty cluttered, but the N mark from the hats is very strong. Tulsa Drillers: While the Drillers have called Tulsa home since 1977, the team's current scheme has only been in use since 2004. The primary logo consists of a man drilling into a baseball, flanked by "Tulsa" and "Drillers". The color scheme is very unique, as it is comprised of royal, graphite, black, copper, and light blue. The team also uses a set of alternate marks to reinforce the brand. The caps feature one of said alternate marks: a beveled T with oil dripping from it. The other supporting marks include a baseball with a drill through it, a version of the man drilling sans wordmarks, and a drop of oil that is on fire. The home jerseys have no placket piping, trim, or pinstripes, just a "Drillers" wordmark. The away jerseys do use placket piping to complement the "Tulsa" wordmark, and the alternate jerseys are royal blue with copper piping and the "Drillers" script. Frisco RoughRiders: The RoughRiders moved to the Dallas metro area from Shreveport, where they were called the Swamp Dragons. The RoughRiders use a black, red, and silver color scheme, which is surprisingly unique within the Texas League. The primary logo features a cowboy riding a horse under a western style "RoughRiders" script. The logo is a bit detailed, and some of the thinner lines appear to be difficult to reproduce in various media, such as embroidery. The logo could be very strong with a stylistic update. The secondary logo is a double-R with a black horse coming out from the right side. The secondary logo appears on the home and road caps, which are black and red, respectively. The home jerseys use a Riders wordmark that matches the logo, while the away jerseys rely on a "Frisco" wordmark in cursive script. 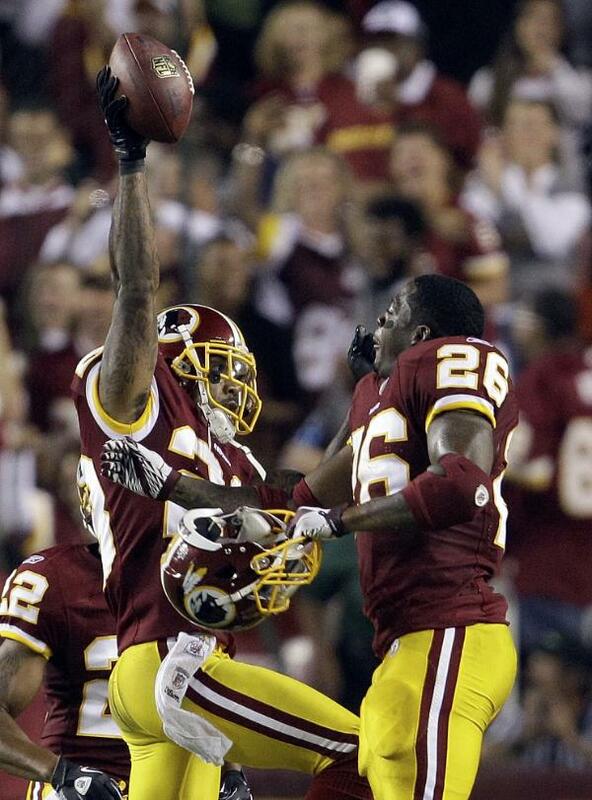 The alternate jerseys are red with a embellished version of the "Riders" script. With a stylistic update, Frisco could have a great identity. 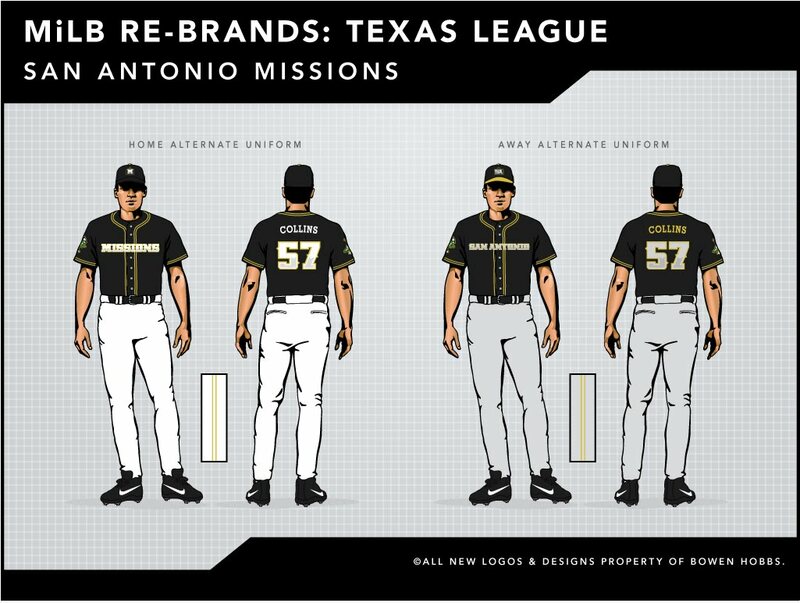 San Antonio Missions: The franchise has called San Antonio home since 1977, but between the '87 and '88 seasons the team re-branded and became the Missions. 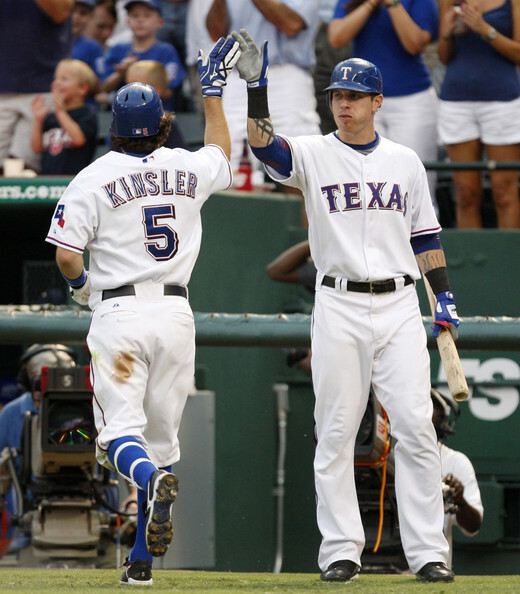 They were previously known as the San Antonio Dodgers. 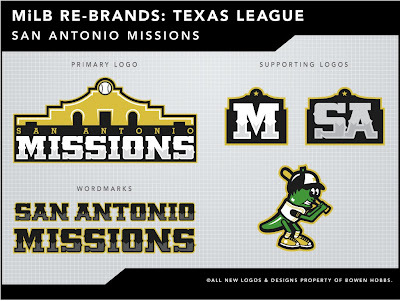 The Missions' primary logo is fairly basic: it's a depiction of the Alamo over "MISSIONS" in a bold slab serif. The problem is the use of white type against a white background. While the bold black drop shadow helps with legibility, the fact that the viewer does not see half of the edges of the letters hinders the logo when it is reproduced in small spaces. In addition, "SAN ANTONIO" appears tacked on, as if it were an afterthought. The secondary logo isn't much better, but at least it appears on black home and away caps. The team also uses a gold Sunday cap. 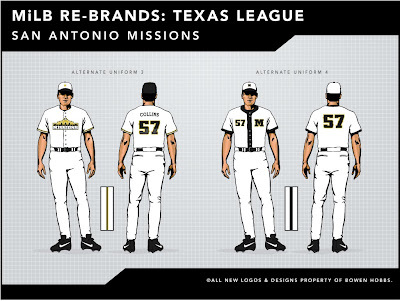 The Missions' home jersey is a vest with trim around the armholes near the shoulder area. 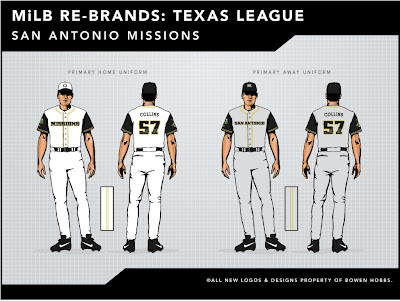 The "MISSIONS" wordmark appears across the chest with the alamo proudly above it. 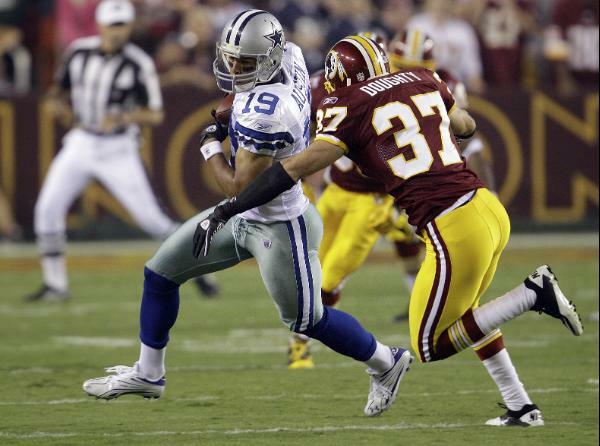 In addition, the player's number appears below the wordmark on the player's left side. The away jerseys are also vests, but use placket piping and a Dodgers-inspired script in black, outline in gold. One nice touch within the "San Antonio" script is the star that dots the I. 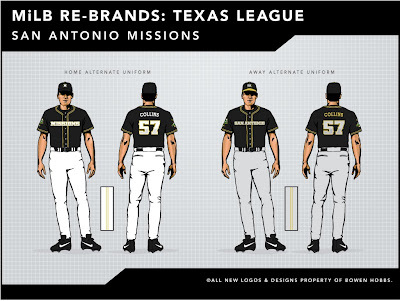 The team also uses an alternate jersey with "Missions" in a white cursive script outlined in gold on a black jersey. The player number also appears on the front of the shirt. The basis of the identity is solid, but the identity package could use a facelift and the type work needs to be standardized. Springfield Cardinals: As I have stated before, I've never been a fan of a team using the parent club's identity. I know it's a common practice in the lower levels of A-ball and Rookie Leagues, and that is exactly what it makes the Springfield team look like. There are plenty of ways to interpret the cardinal theme without simply swapping out a script. The team also has a sleeve patch with the cardinal inside the state of Missouri, which would be better if kelly green, spring green, and light blue weren't added. In addition the lower right corner of the logo has an awkward tension between the cardinal's wing and the outline of the state. The two primary caps feature an S logo with a cardinal, while the Sunday cap uses a batting cardinal and a C. To make matters worse, the team places "Springfield" on both the home and away jerseys, just like the Texas Texas's. Arkansas Travelers: What can I say about the Travelers? I understand it's a difficult name to work with identity-wise, but how is this the best possible answer? The primary logo doesn't even have the full team name in it. Instead, it uses valuable graphic real estate on a slogan that doesn't even belong in the logo in the first place. It's no wonder none of the secondary logos even follow the branding of the primary. The home, road, and alternate caps use an LR logo with or without a star (depending on the cap) and the word "North" in a script. Once again, I can understand the logic of the LR logo on the the caps, and the logic of complementing it with a star, but the generic script "North" is too much. It's almost impossible to read, and the font used looks like it came from the 80s (and not in a good way). The home and away jerseys, by contrast, are rather simple. This identity isn't much of an identity at all, as it's wildly inconsistent. At least travelers outside of Arkansas understand the idea of matching. 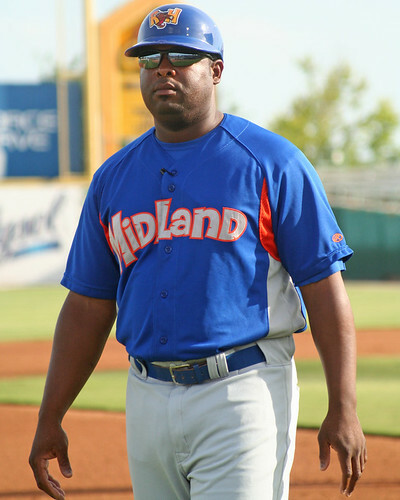 Midland RockHounds: It looks like Scooby Doo and the Flintstones had a baby. The primary logo consists of a hound dog, wearing what appears to be a tunic from the town of Bedrock and a hard hat, holding a bat and a ball. In the background, oil derricks are gushing and the whole scene is cropped by a jagged circle with Mildland in African tribal-styled lettering. "RockHounds" appears in a chipped stone font that is more playful than tough over the entire logo. The sundial watch is a nice touch within the prehistoric theme, but the whole theme should probably be scrapped, as it appears to be left over dino-mania from the Jurassic Park movies. Working within the prehistoric theme, the the hound could have been made of stone or fossilized, instead of wearing prehistoric animal print. In addition, the type could be less goofy. Personally, I would try to bring out the intrinsic strength of rock, over making the rock look fragile by showing it chipping away. The team also has two supporting marks that appear on caps and inexplicably use red, when the primary logo shows the hound in an orange and blue tunic. The cap logos also use a gradient, which doesn't appear anywhere else in the identity. The jerseys (here is a picture of the road jersey) look like batting practice gear due to the side panels, which are modern and do not fit the prehistoric theme. This identity uses all the bells and whistles, but sometimes, too much is really just too much. Simplification would really help. • I loved seeing the Eagles in kelly green this last weekend, now if only they mixed the lighter green with their current scheme. • Another thought on the Eagles' throwbacks: The sleeve numbers didn't match the the front and back numbers. A team probably couldn't get away with that today, but the throwback's purpose is historical accuracy, not modern aesthetics. 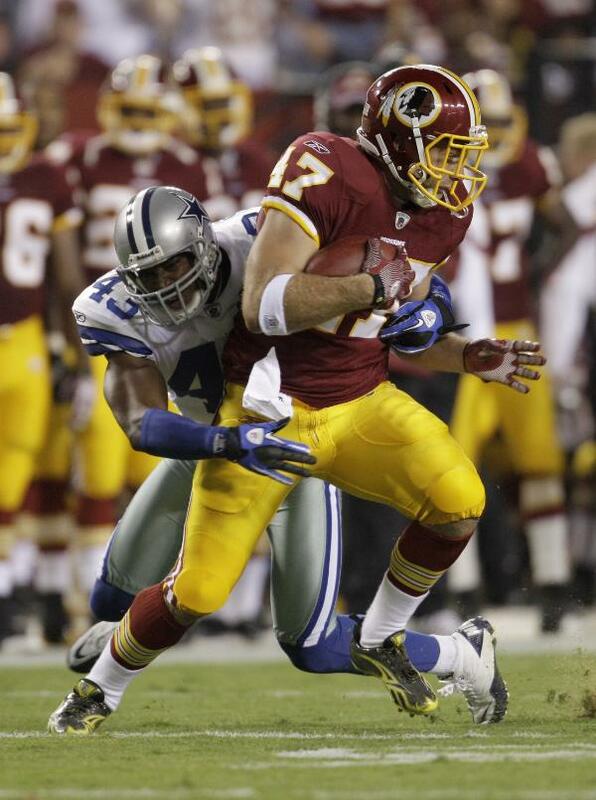 • The Redskins decided to break out gold pants for their Sunday night game versus the Cowboys, along with socks from the 70th anniversary uniforms. 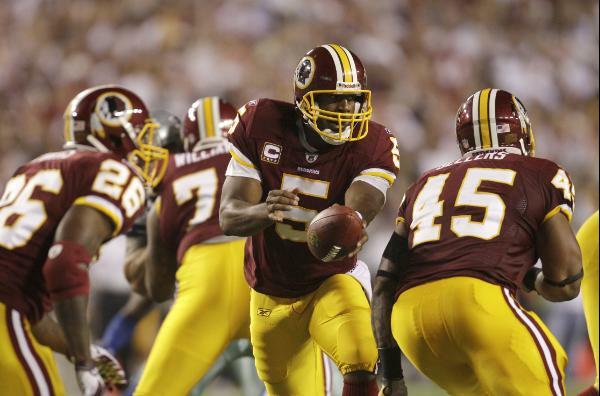 On Sunday, the 'Skins sported four non-matching striping patterns: one on the helmet, one on the jersey sleeves, another on the pants, and one on the socks. 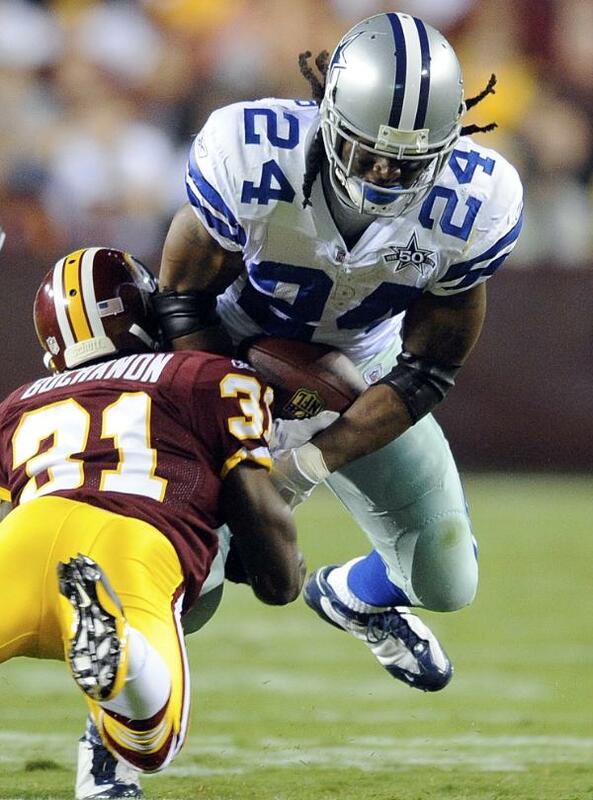 Considering they were playing the Cowboys, this was a clash of the non-matching (the Cowboys and their loose sense of a color scheme vs. the 'Skins stripe-o-mania). I liked the idea of pairing gold pants with a burgundy jersey, but it doesn't mean all other principles of deisgn can blatantly be ignored. 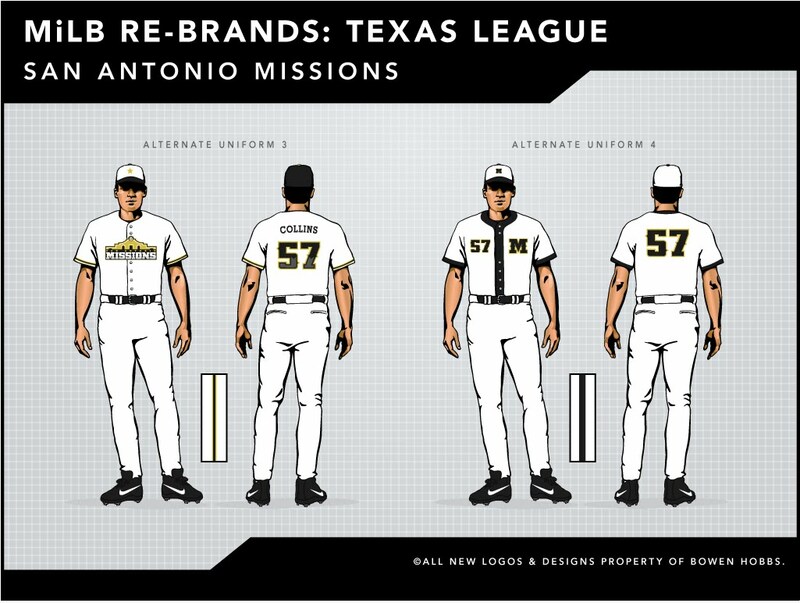 Today's design is an elaboration of what the San Antonio Missions could do to improve their brand. In my re-brand, starting with the primary logo, I created a single holding shape around the entire mark, so the word "MISSIONS" isn't lost, like it is on the current logo. This also allows for the mark to appear as a unified whole, not a collection of parts. I added silver and a darker grey to the color scheme to create a western-style wordmark with dimension. The baseball is now placed at the top of the Alamo, instead of flying over it, for a more concise depiction. The cap logos are letter-based marks of an M and an SA, both of which are enclosed in abstract Alamo shapes. I have also created a logo to honor the team's mascot, Ballapeno. The wordmarks are consistent with each other, unlike the current scheme, which features the slab serif on the home jersey, and traditional script on the away and alternate jerseys. 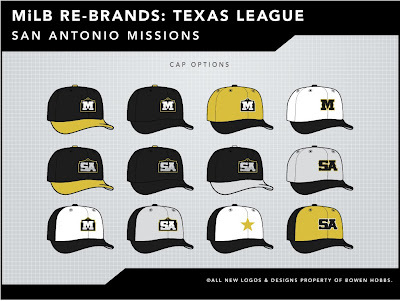 The cap options include various uses of the secondary logos, in addition to versions of the M and SA logo that do not use the holding shape. I also created a cap based on the helmet in the Ballapeno logo, with a simple star and two white front panels. The primary home and away uniforms start with vests. Then, I applied a double-stripe of gold as placket piping, sleeve trim, and pant striping. Ballapeno appears as a sleeve patch as well. The home uniforms use a trucker-style cap with a white front, while the away uniforms use a solid black cap with a gold button and silver lettering. The home and away alternates feature black jerseys with the double-stripe scheme. The home alternate is paired with a black cap that features the M-in-Alamo logo, while the away alternate is complemented by a gold-brimmed cap. Alternates 3 through 6 are options for a possible fauxback design. 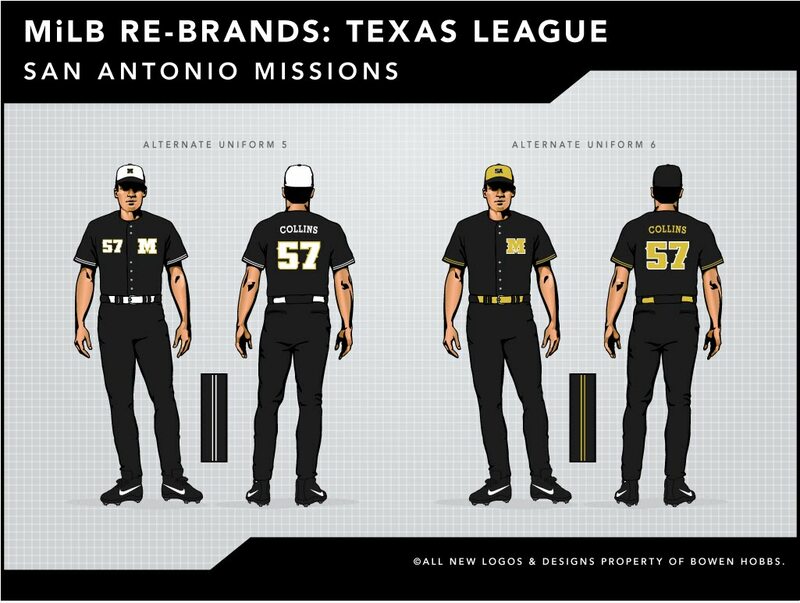 Alternate 3 has an 80s style, complete with the Ballapeno cap, and the Alamo appearing on the front of the jersey, similar to the current uniforms. Alternate 4 features a vintage contrasting placket design, with the more traditional M on the jersey and a white cap. 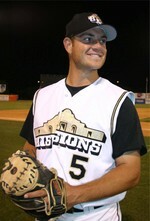 Alternates 5 and 6 are feature black jerseys and pants with more traditional typography. While Alternate 5 is paired with a white cap, Alternate 6 is paired with a gold front trucker-style cap. 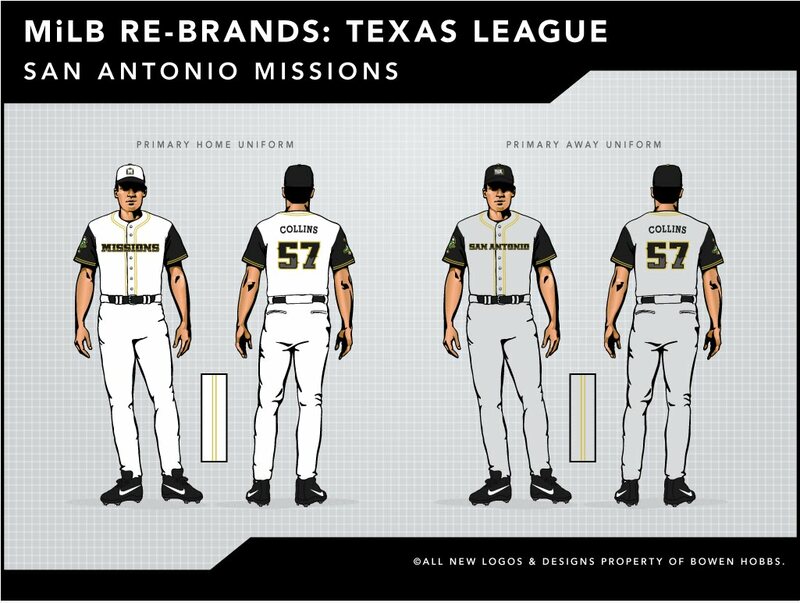 Feel free to comment on the branding efforts of the Texas League, the uniforms stylings of Week 1 in the NFL, the Missions concept above, or anything sports branding related. Great stuf. I'd love to see what you'd do for the Frisco RoughRiders. I'm a season ticket holder there and, while I like when they go with their all white uniforms, I'm very underwhelmed by their red.